An administrator reports that the System Event log data is only available for 24 hours when reviewing the Hardware Status tab. Which condition could be responsible for the loss of data? A. A Reset event log was executed. B. The statistical collection level was set to a value of 1. C. The boot disk of the host is corrupt. D. Syslog has been configured at the vCenter Server level. A vApp is running out of compute resources when overall activity is high within the resource pool. At other times, everything is fine. A. Increase the size of the resource pool Shares. B. Set the vApp’s CPU and Memory Reservation Type to Expandable. C. Set the vApp’s CPU and Memory Limit to Unlimited. D. Create a new resource pool with the existing hardware configuration. An administrator logs into the vSphere Web Client, but is unable to see any hosts and clusters. A. Verify that the client web browser and vCenter Server are in the same broadcast domain. B. Verify that the vCenter Server system is registered with the same Platform Services Controller as the vSphere Web Client. C. Log in to the vCenter Server as a user within the Active Directory domain. D. Log in to the vSphere Web Client as a user with permissions on the vCenter Server system. 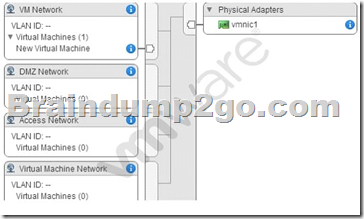 An administrator deploys vRealize Operations into a vSphere 6.x environment. After the deployment, the administrator notices that badges are not appearing. A. Badges do not appear until you register vRealize Operations with vCenter Server. B. Badges do not appear until you register a vCenter Server in vRealize Operations. C. The vRealize Operations appliance needs to be redeployed. D. The vCenter Server appliance needs to be redeployed. A. The virtual machine has vSphere Fault Tolerance disabled. B. The virtual machine is a template. C. The virtual machine swap file is on a shared datastore. D. The disk is a CD-ROM/ISO file. You are editing the management network configuration of an ESXi 6.x Host from the vSphere Web Client. You mistakenly put the incorrect VLAN in place for the management network. A. Add the host to vCenter Server and if it works, then all networking settings are ok.
B. Select the Test Management Network option from the DCUI. C. Connect to the host with the vSphere Client and click the Test Network option. D. Use PowerCLI to connect to the host and initiate a network test. An organization has an ESXi 6.x host that contains two resource pools. The host is being relocated to a DRS cluster.